Want to look like a Mediterranean millionaire? This is the only yacht you’ll need. Haurex founders Maurizio Bianchini and Giuseppe La Guisa always knew that a good watch was more than just a time keeping tool. From the very beginning, they set out to create spectacular fashion accessories that also told the time. 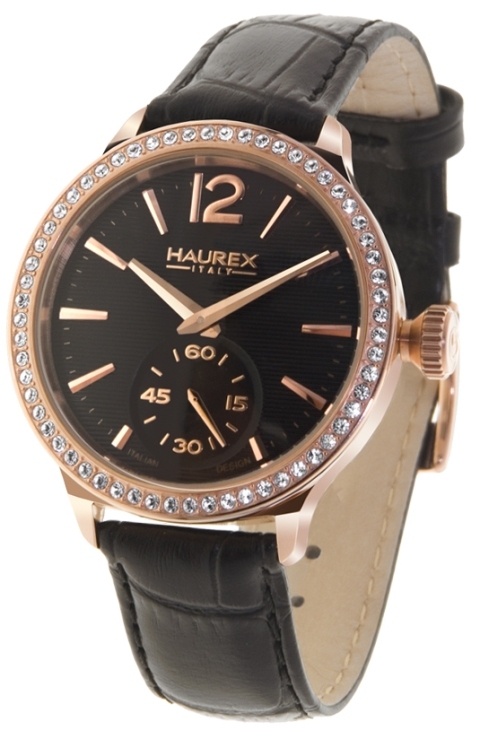 Their success at translating the latest fashion trends into wearable and affordable timepieces has made Haurex a favorite with fashion-forward women around the world. It’s easy to see why. 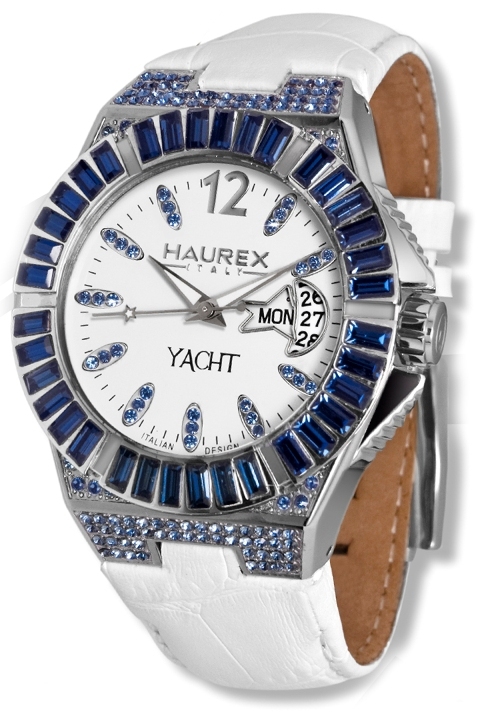 Who wouldn’t want to wear a watch like the amazing Haurex Blue Crystal Yacht Lady? Put one of these dazzling, crystal encrusted beauties on your wrist and you’re an instant Mediterranean millionaire. The entire bezel of this spectacular timepiece is studded with brilliant blue crystals. 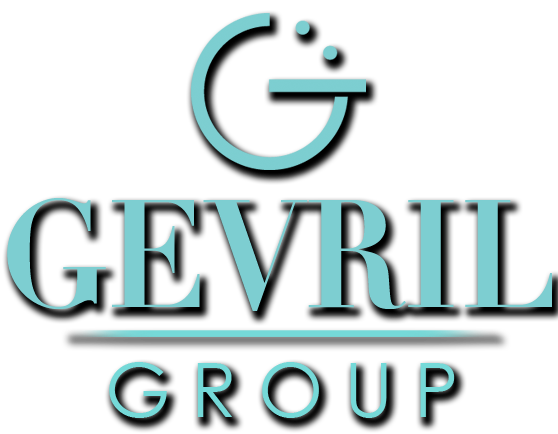 Additional blue crystals form the indices, and the entire front face of the case is a pavé crystal pattern. A pair of whimsical star and moon silhouettes are utilized for the day and date windows and the sweep second hand has a small star as a pointer. The 40mm stainless steel case is large enough to make a statement, yet well proportioned for a woman’s wrist. With its 23mm ice white padded leather strap, this over-the-top timepiece exudes unabashed luxury. The Blue Crystal Yacht Lady is powered by a precision quartz movement designed to provide years of reliable service. This exquisite timepiece is equipped with a durable mineral glass crystal and is water resistant to 330 feet. If you’re a fashion-forward woman who likes to make a big statement, don’t miss this opportunity to add a bit of bling to your wardrobe. You don’t need a yacht to start looking like a Mediterranean millionaire. You just need a Haurex Blue Crystal Yacht Lady watch. To put one on your own wrist, contact your authorized Haurex dealer today. Think of it as fine jewelry that tells the time. From the day Italian watchmaker Haurex opened for business 24 years ago, they understood that women don’t buy watches simply to tell the time. 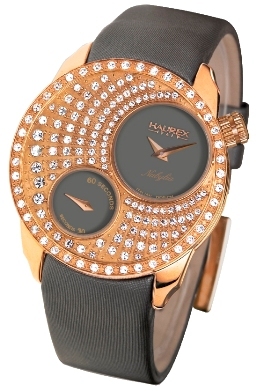 Haurex understood that a wristwatch is also an important fashion statement and set about creating one of the most fashion-forward watch lines available anywhere. The stylishly innovative Haurex Nabylia Collection is a testament to the company’s success. This spectacular 38mm timepiece could easily be worn as fine jewelry. The sparkling dial is studded with genuine Swarovski crystals that are circled by a bezel with even more Swarovski crystals. Floating in this shimmering sea of crystals are two independent, elegant gray sub-dials that display the hours and seconds. This stunningly elegant timepiece is powered by a precision quartz movement that has been engineered to provide years of reliable service. The crystal encrusted stainless steel case is water resistant to 33 feet and has been fitted with a beautiful 11mm gray satin band strap that matches the colors in the watch’s dial. When Maurizio Bianchini and Giuseppe La Guisa and founded Haurex in Bologna, Italy in 1989 they knew that if they could do the same thing for watches that Ferrari did for cars and Versace did for fashion, they would be successful. All it takes is a single look at the spectacular Haurex Nabylia to see that their vision has been fulfilled. If you’d like to see this glittering example of Italian design on your own wrist, contact your authorized Haurex dealer today and reserve your Haurex Nabylia Swarovski Satin watch immediately. The Haurex INK STONE offers a glitzy take on the everyday sport watch. 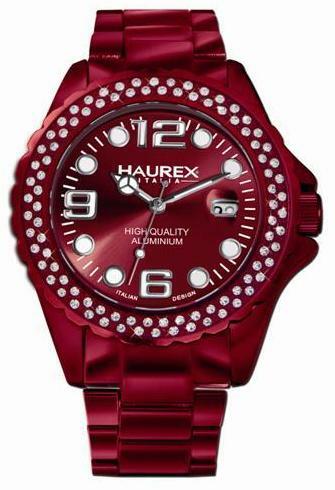 Vibrantly colored jewelry is on everyone’s wish list and watches are no exception: one look at the INK Stone and you immediately see that this is what the designers at Haurex were after when they created it. The fashionable collection features bright colors, light aluminum cases and Swarovski crystals inlaid on the bezel for added sparkle. Just choose your favorite color and go! Like its ultra-sporty cousin the INK, the INK Stone is a sports watch. But unlike the INK, the INK Stone replaces the diving-style bezel (or top ring) with a decorated version inlaid with Swarovski crystals. The effect is a glamorous twist on the everyday dive watch that puts a stamp on the wearer’s individual style. The dynamic red-sunray dial is a serious standout. The dial elements extend the bold theme with raised indices coated with luminous paint, including large numerals at 12, 6 and 9 and hour markers on the other hours except at 3, where the date window appears with a magnifier. One thing’s for sure: this watch will never leave you squinting or alone in the dark! The 37 mm aluminum case is coated with red PVD, including the bezel and crown. The bracelet, also made of aluminum, is coated with PVD and features a stainless-steel buckle for added strength and release pushers. For those who know they will be in the water or enjoying tropical climes, a silicon strap with tang buckle is also available. The INK Stone is water resistant to more than 100 feet so you can get more than just your feet wet.